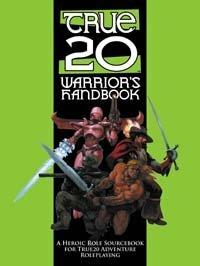 The latest True20 supplement, Warrior’s Handbook, completes a series of three books on the heroic roles of characters that began with Expert’s Handbook and Adept’s Handbook. This one is all about combat, covering everything from one-on-one fights to mass battles. The book includes new rules for large-scale combat, as well as new feats and skills. Warrior’s Handbook is currently available as a PDF from Green Ronin’s store but will soon also be available in print.